Our state-of-the-art cop vehicles keep those in law enforcement safe. 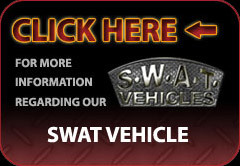 For over twenty years, Swat-Vehicles.com has specialized in providing the safest, most cutting edge cop vehicles for law enforcement professionals all over the world. Each armored cop vehicle sold is built with the safety of law officials in mind for the highest level of security. Our company sets the international standard for what is safe in the armored cop vehicle industry by taking an aggressive approach in the constant effort to increase the safety and security of law enforcement professionals. We understand that buying an armored law enforcement vehicle is an investment in your safety and the safety of those in your charge. That’s why every element of our armored cop vehicles has been designed and tested to perform under intense pressure with stringent quality controls for ballistic integrity. Our world-class engineering and design team can build any law enforcement vehicle and tailor it to the needs of each individual client. We have the expertise and resources available to build everything from armored cop cars to million dollar MRAP vehicles.